While at the Prieure Notre Dame D’ Orsan in France, I took the opportunity to also visit other gardens. I specifically selected gardens with orchards where I could see the historical French pruning techniques used to train fruit trees into different forms. The highlight in Paris was the Potager du Roi or the Kitchen Garden of the King, near the Palace of Versailles. Walking through the large collection of very old, beautifully formed trees was an unique experience. On a Saturday afternoon with no other visitors, the garden felt like a lost world – a secret to be discovered. It gives the impression of being wild, and yet each tree requires skill and disiplined patience over many years, often decades. The layout of the garden – with high walls to form protected rooms, raised terraces to get a good overview and vaulted passageways linking the different parts of the garden – all add to the drama. The gnarled old pear trees in full fruit were irresistable. Some were grown as espalier trees against the walls while others were trained on frameworks. I loved the double U forms grown as proud candelabres and the cordon with 5 double arms enclosing the vegetable gardens (see above). 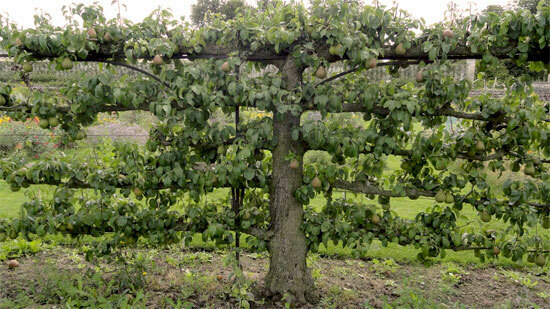 The special feature of this garden must be the pear tree formed into a large vase, with 16 leading branches arranged around the trunk (see below). 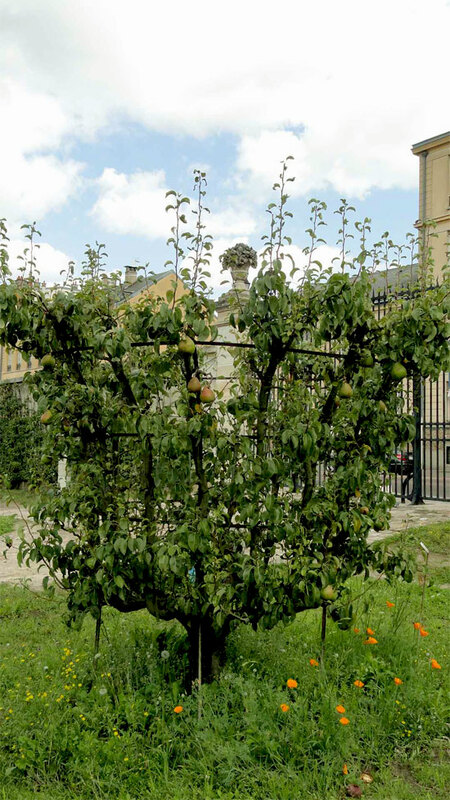 When the Jardins du Luxembourg in Paris were opened to the public in the 19th century, visitors could come and feast on fruit from the orchard for a small fee. 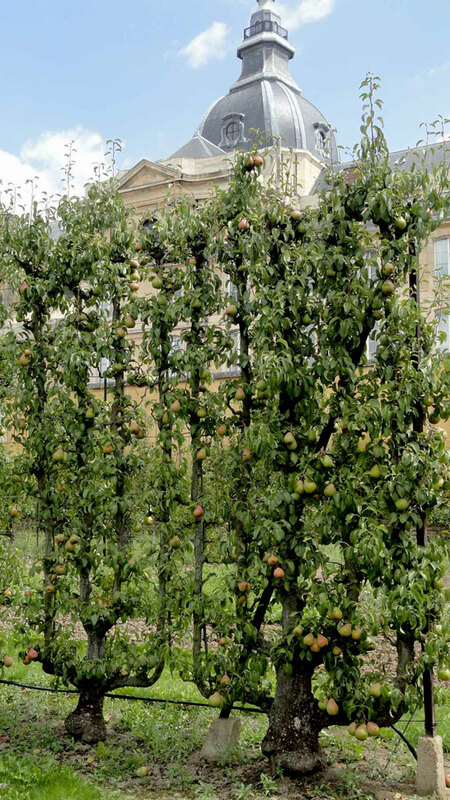 These days, the orchard is situated in a small, enclosed corner of the garden and I could unfortunately only look through the fence at the more than 200 apples and pears beautifully trained into different shapes. 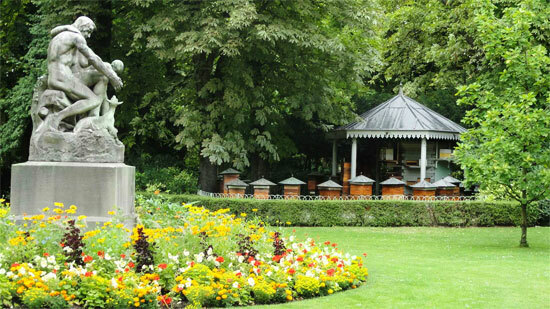 Not far from the orchard was a collection of bee hives which I found very interesting, but what I enjoyed most was to see Parisians at play, with young and old having fun in the park on a Sunday afternoon. Check in again tomorrow for more about Liesl’s trip through the gardens in France.